A 3 hour hands on masterclass with Chapter One’s Michelin starred Master Chef Ross Lewis at Cooks Academy, “Dublin’s premier cooking school” on Sunday January 29th, 2012. 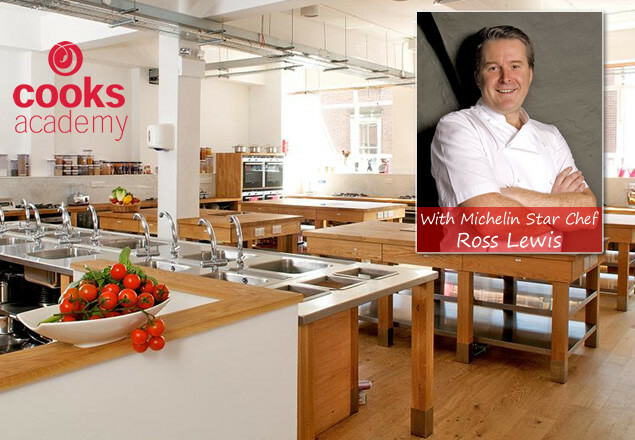 Cooks Academy have teamed up with Ross and Chapter One restaurant to offer readers of The Irish Times an exclusive masterclass. You will watch a cooking demonstration by Ross and then have the opportunity to cook two dishes alongside him. It’s not every day that you get to cook with a Michelin star chef! This really is a “money can't buy experience”, perfect for those looking for a very special Christmas gift or for those looking to treat themselves. Ross Lewis is one of Ireland’s top chefs having been awarded the Michelin star for his restaurant “Chapter One” in 2007. Amoungst many other plaudits, Ross was honoured to be asked to create the menu and lead the kitchen team at the State banquet held at Dublin Castle for Queen Elizabeth II's historic visit to Ireland earlier this year. Cooks Academy is a world class cookery school boasting an 80 seat demonstration theatre and hands on cooking facilities for up to 72 people in the 4,500 sq ft specially designed Kitchen. There will be two separate events - one from 09.30-12.30 and the second from 14.00-17.00. Participants on each master class will watch two demonstrations by master chef Ross Lewis. Participants will cook the two dishes demonstrated by Ross Lewis on the day. There will be two separate events on the 29th of January 2012. One from 09.30 – 12.30 and the second from 14.00 – 17.00. The ticket is for one event only. Please ensure if you’re booking to attend with a friend that you are booked at the same time. Bookings cannot be transferred under any circumstances. Voucher must be mentioned when booking and voucher must also be presented on arrival. This ticket is not valid for any other courses or classes at Cooks Academy and can only be used for this one time only event. Customers wishing to avail of the 10% off offer must claim this by booking any course before January 31st 2012.